Over the past five years and 260 blogs, we have often highlighted the application of digital breast tomosynthesis (DBT) to the screening of women for breast cancer. These stories have included: the benefits of DBT for women with dense breast tissue; the involvement of the Food and Drug Administration (FDA) in the United States; two clinical trials in the United Kingdom; and the pendulum finally swinging towards DBT. Commentator Greg Freiherr has suggested that women’s health needs a “one-armed modality”, paraphrasing Harry Truman who was frustrated by advisors that gave him good news “on the one hand” and bad news “on the other.” He wondered whether DBT could be the technology that provided outstanding performance on the one – and only – hand. 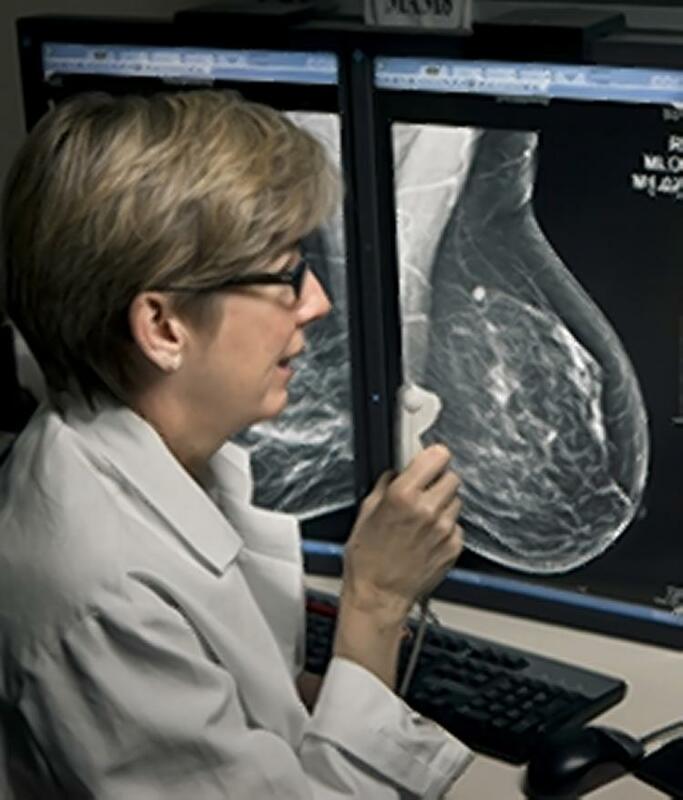 However, for DBT to replace full-field digital mammography (FFDM) as the gold standard for screening, it needs to address a major issue: many clinics using DBT have continued to acquire two-dimensional (2D) mammograms via FFDM, effectively doubling the radiation exposure of the women being screened. 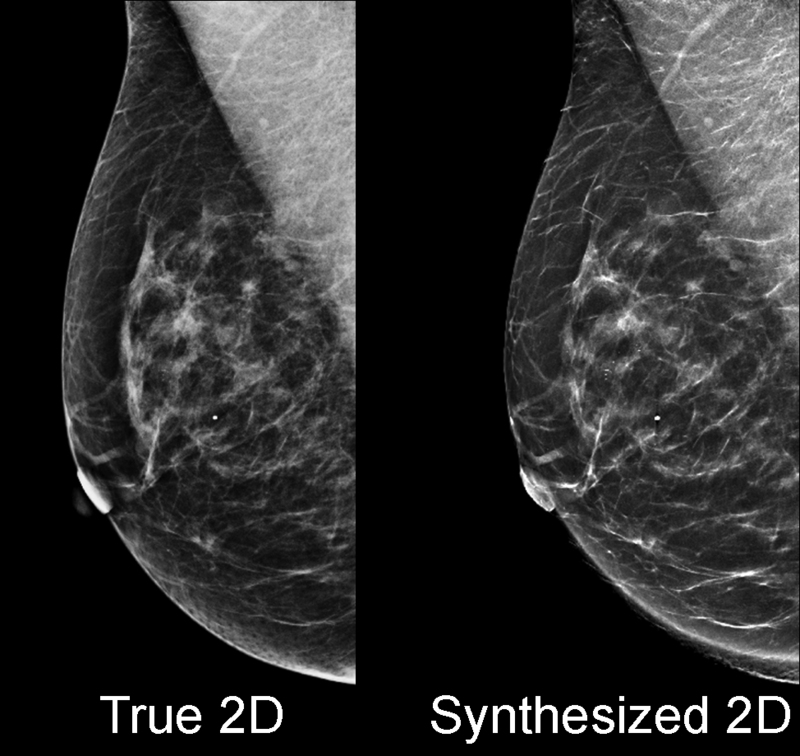 Two recent articles have provided evidence that true 2D images acquired by FFDM could be replaced by synthesized 2D images generated by DBT (see comparison above right). A group of researchers from Italy and Australia, writing in Lancet Oncology, studied 9,672 asymptomatic women and identified 90 cancers. Whereas FFDM alone had a detection rate of 6.3 per 1,000 women screened, this number rose to 8.8 when DBT and synthetic 2D images were employed. There was a slight increase in the false positive rate from 3.4% to 4.5%, although the authors conceded this might have been influenced by their study design which incorporated sequential reading. The second paper, from a group of researchers at the University of Pennsylvania, was published in Radiology and compared: cancer detection rates; recall rates; biopsy rates; and radiation dose. They examined 15,571 women screened with FFDM and DBT, followed by 5,363 women screened with synthesized 2D images and DBT. There was no statistical difference in the cancer detection rate, but both recall rate and biopsy rate were reduced, while radiation dose was decreased from 8 to 5 mGy. Co-author Emily Conant (seen left) believes that synthetic 2D images will improve in quality as reconstruction algorithms are optimized. She concluded “I do very much believe that synthetic imaging is the way to go, with tomosynthesis to answer the 2D task that radiologists need to address.” That is good news for women, although DBT still misses cancers that are detected by the addition of automated breast ultrasound. 7,97 mGy for DBT and conventional mammo (5 x Ned). So dose conventional mammo: 3,1 mGy (2 x Ned).